Roger Heyes squirts the Kawasaki Z1-B to victory in the 1976 Castol Six Hour race. 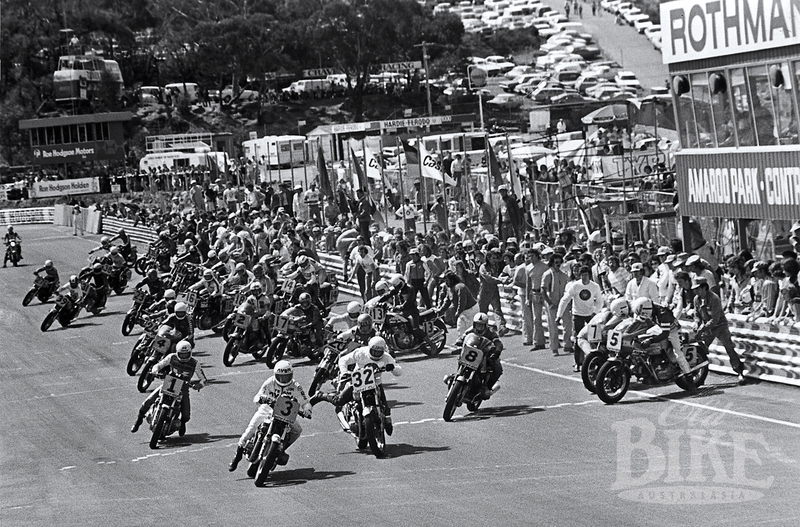 By the mid 1970s, the Castrol Six Hour Production Race was the biggest thing in Australian motorcycle sport. It had grown like topsy from an argy-bargy affair in 1970, to a heavily trade supported, nationally-televised event that was thick with race tactics, rule twisting, tyre wars, protests and more hullabaloo than the rest of the season put together. And while the motorcycle trade piled in with increasing gusto, not every bike on the grid enjoyed anything like substantial backing. Indeed, in 1975, the majority of the entry was still made up of enthusiasts who just wanted a good thrash around Amaroo Park. Realistically, the outright and class winners could be selected from a mere handful of runners, while the others made up the numbers, and via their entry fees, contributed to the prize money coffers. One such entry in 1975 was a pair of keen young blokes from the NSW Central Coast who combined surfing, partying and tearing around the streets on motorbikes – much the same as a great number of their generation in the swinging seventies. Erik Soetens had a H2 Kawasaki 750 triple that was definitely the Duck’s Guts at the time when it came to belting up and down the old Pacific Highway. His mate, Jim Budd, hankered after a similar machine but had to make do with a Honda CB750, which he punted with incredible verve. Both were members of Wyong Motorcycle Club. 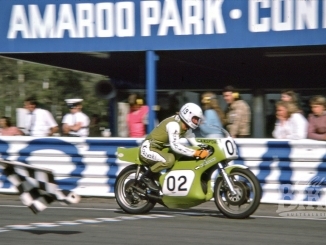 The lads had little in the way of race experience, although Erik had ridden at Bathurst in 1974 on the H2 and Budd made his debut at the mountain the next year, on his newly-acquired Kawasaki 900. 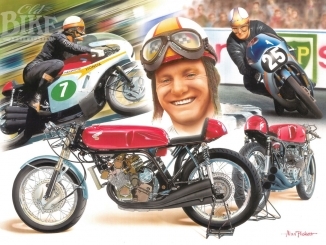 Later that year, Soetens and Budd decided to have a crack at the Six Hour, using Jim’s new Z1-B. Preparation consisted of fitting a set of Avon Roadrunner tyres and setting the tappets, although there was a small matter of a strictly illegal fuel tank swap. Checking Jim’s Z1-B tank against a mate’s Z1 version, it was found that the earlier tank held fractionally more juice, so it was used, and escaped the scrutineers’ gaze. That year’s race will be remembered for the heroic solo ride by John Warrian until his Ducati’s gearbox seized, handing victory to the glamour Kawasaki team of Gregg Hansford and Murray Sayle, over Ken Blake’s 900 BMW. But quietly into third place, four laps behind the winner and almost unnoticed, came the completely unsponsored Central Coast pair, just ahead of another low-key Z1 entry – Roger Heyes and Shaw Crymble. Erik and Jim earned $700 in prize money, or nearly half the price of the bike. 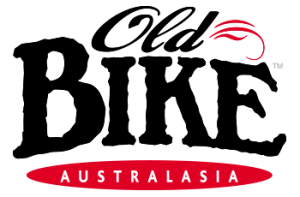 Budd had done the majority of the riding and was the quicker of the two – a performance that did not go unnoticed by Lindsay Walker, the head of Walker Radial, Australian Avon tyre importers. 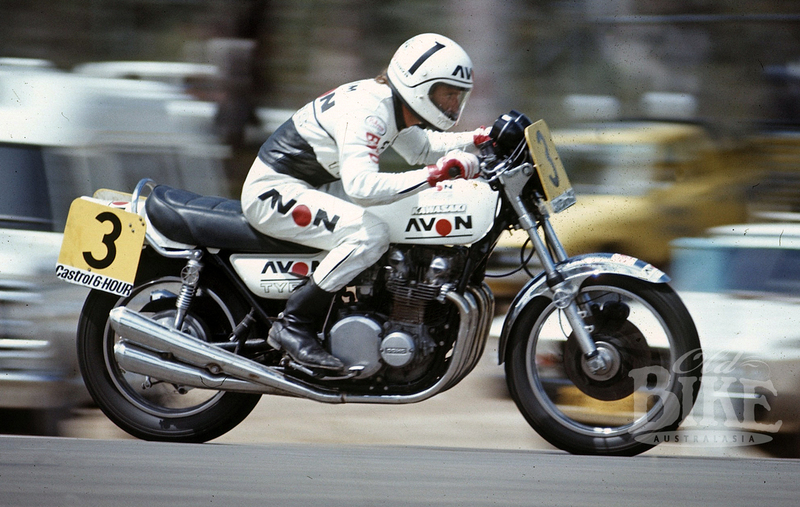 For 1976, Walker decided to establish his own six-hour squad – Team Avon Tyres – and signed up both Budd and Heyes, as well as buying Jim’s Z1-B (with it’s correct fuel tank). This was tested alongside the new Z900 and the elder bike was found to be markedly quicker, although heavier on fuel – thanks mainly to 28mm carburettors against the Z900s 26mm. The team’s effort for the 1976 Six Hour was thoroughly professional – the riders resplendent in white leathers designed by Sydney artist Alan Puckett, the bike and pit crew in the same white livery. At the Walker Radial base in Sydney’s Dulwich Hill, the squad spent hours practicing refuelling, to the point that Walker noted that the bitumen pavement outside the building was almost eaten away by fuel spilled during the exercises. They had the refuelling stop down to a theoretical 12 seconds, until Greg Easton, another Central Coaster and a skilled engineer, devised a new internal system for the mandatory 20-litre refilling drum. By fitting a spiral pipe with a central breather, Easton created a swirling effect which rammed the fuel into the tank in about half the time – a ploy that was kept top secret until the first pit stop of the race. Jim Budd (3) grabs the advantage at the start of the 1967 Castrol Six Hour. Behind, Garry Thomas (32) gives his Z1 too much throttle. Others in the fray are Gregg Hansford (1), Helmut Dahne (4), Kenny Blake (2) and Joe Eastmure (8), while John Warrian (5) and Danny Oakhill (7) struggle to kick start their Ducatis. The team left nothing to chance and even assembled their own lap scoring crew to counter the confusion and the barrage of complaints that had dogged the first six runnings of the race. In qualifying, Budd was one of only six riders to break the 60 second barrier, but he was secretly confident that he could do it under race conditions as well. 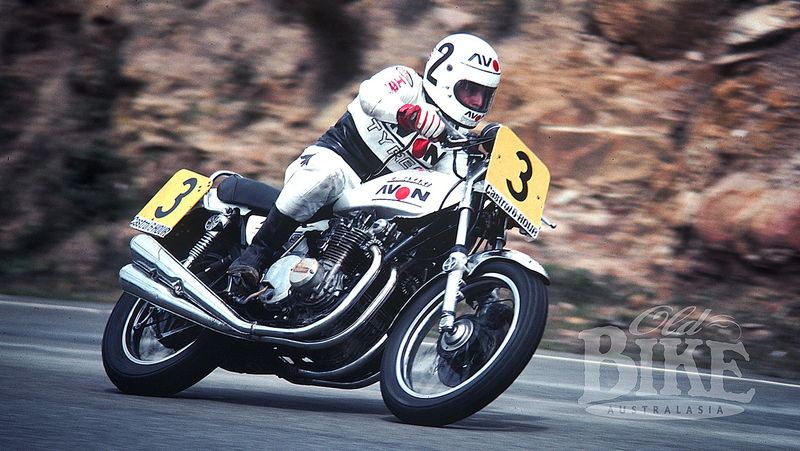 Heyes was only fractionally slower but late in the session, Team Avon’s military-precision build up came unstuck when Roger dropped the Z1-B at Dunlop Loop, necessitating an all-night rebuild to replace a bent frame. The wreck was taken to Peter Molloy’s workshops in Belmore where Willoughby officials supervised the entire operation. However when the patter of feet from the Le Mans Start stopped and the first engine roared into life at flag- drop 10am, it was the white Avon bike, with Budd aboard, immediately into the lead. Garry Thomas gave his Kawasaki such a handful of throttle that it snapped sideways, all-but throwing him over the top. Pole-sitter John Warrian took several kicks to commence his Ducati, and dropped way down the field. Lapping at his qualifying time, Budd disappeared into the distance – playing the trump to set a scorching early pace in order to build a sufficient gap to button off later in the race when the tyres were spent. Warrian was the thorn in the argument, as he moved into second and stalked Budd, knowing he would have one less fuel stop. The Avon Z1-B was into the pits 77 minutes after the race began, and for the first time the ‘Swirl-filler’ sprang into action and the bike was away with Heyes in the saddle after being stationary for just 6.5 seconds. Warrian took over the lead with 40 minutes still in the tank, with the BMWs enjoying a similar on-track reshuffle. Team Avon was back into the lead just after half distance and remained there for the rest of the race. The early pace had been eased to 63-second laps as the rear tyre passed its prime, but the buffer to the Ken Blake/Tony Hatton BMW R90 S was still more than half a lap when the chequered flag came out at 4pm. Budd and Heyes, who rode with his wrist strapped after his qualifying crash, averaged 113.19 km/h and beat the previous race record by five laps. For Avon, it was their third victory in a row and their first as an official entrant. Jim Budd… flat-out at Amaroo Park in the 1976 Castrol Six Hour Production Race. After the frame swap, Budd’s old Z1-B had already lost some of its provenance, and the 1977 season took care of a good deal more. Team Avon acquired several other Z1-Bs in the knowledge that the old bikes were a much better bet than either the Z900 or the new Z1000. The hectic race program in 1977, which included Bathurst and several national open meetings as well as the ‘endurance’ races such as the Calder Two Hour and Surfers Three Hour races, meant that bits were swapped from bike to bike on a regular basis. Greg Easton however, had the foresight to collect many of the parts from the 1976 Six Hour-winning machine, and store them away in their as-raced condition. Thus it came to be, almost thirty years after the event, Erik Soetens bumped into Greg Eaton in a supermarket. Naturally the talk swung to the good old racing days and greg disclosed that he still had the white Avon tank, seat, side covers and sundry other parts from the winning 1976 Z1-B in his garage. By the time he’d got his groceries home, Erik had formed a plan to recreate the machine. Erik is a self-confessed Z1 tragic (he currently has six), so he had no trouble in assembling a Z1-B and fitting the Avon equipment. Probably the most difficult aspect of the job was locating a set of Avon Roadrunner tyres, but these were eventually sourced (the front one came from the roof of my workshop – Ed.). “The rear was so old I couldn’t get it off the rim”, said Erik, “so I swapped the whole wheel. They’re as hard as rocks – strictly for show only.” In assembling the machine, Erik made contact with Lindsay Walker, who still had Jim’s white Avon leathers, and donated them to the project. Sadly, Jim Budd is no longer with us, succumbing to a heart condition five years ago. However his team mate from those days, Roger Heyes is very much still in the fold and still racing superbikes and supersport machines in Queensland, where he has lived for 20 years. 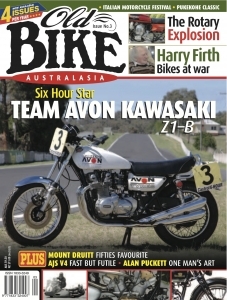 The recreated Team Avon Z-1B is now on display at the National Motor Racing Museum at Bathurst, alongside another Six Hour winner, the Wayne Gardner/Andrew Johnson Honda CB1100R from 1980.